Posted On January 31, 2016 by Team iCynosure. The fact that Australia is the remotest countries in the world makes it the most intriguing places for travellers to explore. It has over the years grown as a major backpacking, camping and driving destination offering varying experiences that makes it a hit with all travellers. No matter what you love to do, you will find enough things to do in this gigantic country. With the cost to cover the vast diversity is unimaginable, I definitely need to start saving up for my next travel adventure. One of the most famous reef systems in the world, the Great Barrier Reef is world-renowned for its abundance of marine life and world-class diving opportunities. With a ton of marine life and beautiful coral to explore, diving is a must do the activity; even if you don’t dive you can take a boat to go snorkelling. Ayer’s Rock popularly known as Uluru is the biggest attraction of the country especially for its spectacular views at sunrise and sunset. Considering it is just a big rock (similar to the ) it is a sight to reckon with, as the wind blowing effects great changes in the shades of the sky from amber to red and orange. Though scaling the rock is allowed as a tourist activity, it is not appreciated as the Uluru is considered to be a sacred area. Nothing can beat a short cruise across some of the most beautiful sand islands in the world. Whitehaven beach is mesmerising with its share of exotic creatures especially the turtles and dolphins. Some of these islands have resorts that make your stay as amazing as a paradise island. Very few travellers explore the unbeaten track to Tasmania that has amazing hikes, beautiful bays, small townhouses and ferry rides. It’s one destination in the highly visited country that still remains virgin to the world of tourists. Whether you are a professional or a beginner, every beach offers you surfing experiences especially on the Gold Coast in Brisbane. It is fun to feel the waves below your feet as you rise in the air and at times crash into the water. With over 50,000 km of coastline, there are many many beautiful beaches to visit. One will be spoilt for choice with both the East coast and the West coast. For more secluded beaches head to the western coast and enjoy a relaxed day at the beach. Australia has a continuous stretch the largest tropical rainforests in the world that are perfect to go hiking and camping. While bird and wildlife watching is a major sport in Queensland, there are numerous other options to choose from if you want to get away from the hustle-bustle of the city and relax. Cape Tribulation is one such place that offers a great mix of beach, jungle and birds. Melbourne is a must visit place in every cricket lover’s travel diaries, however, the city offers much more than just the ground. There are clubs with exotic music, cafes with traditional approach and restaurants with a variety of cuisines. Walk alongside the river, picnic at the city garden, jam out at rock concerts or go party hopping at the nightspots to enjoy the city inside out. Apart from many other things Australia is well known for its wineries, especially those at Margaret River near Perth, the Barossa Valley near Adelaide, and the Hunter Valley near Sydney. There is a lot of good wine to be tried while in Australia, especially Shiraz and Pinot Noir. One can take a day tour to a winery or simply take a trip to the wine store and get drunk in the park. Forget the restaurants and enjoy an Australian barbecue in the part sipping on some delicious wine. BBQs are an age-old tradition, and most parks and public areas have at least three BBQ pits where locals get together to spend a warm night with gorgeous wine an sharing stories. 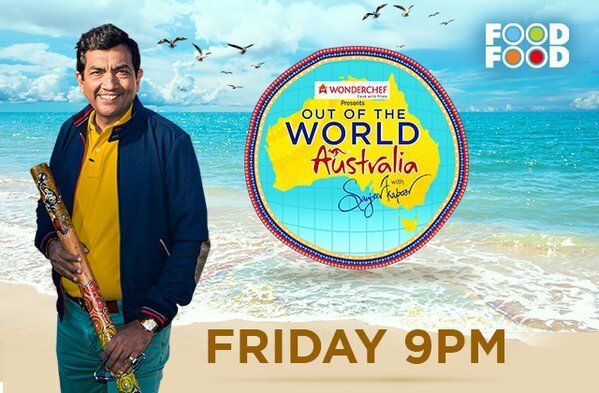 Until you actually get to sample these amazing treats that Australia offers, you can catch these moments live with Sanjeev Kapoor who is travelling ‘Out Of The World’ with WonderChef bringing the country closer to you through your TV screens as #WonderChefLive. So tune into FoodFood every Friday at 9:00 pm and be mesmerised with the adventures SK takes. I hope you are able to do these thing on your list.